Shortages of medicine; the garden of England turned into a lorry park; a surge in red-tape; new tariffs on cars and food; factories halted for lack of parts. Those are the grim scenarios conjured up by planning for a “ no-deal Brexit”. Who in the world would volunteer for that kind of chaos? Quite a few people, as it happens. There are hardline Brexiters who regard the British government’s current proposals for Brexit as a betrayal — and so would prefer no deal. There are ardent Remainers who hope that the spectre of no deal could provoke a political crisis that stops Brexit altogether. And there is the European Commission, which sees no deal as preferable to compromising on the basic principles of the single market. Together, these three groups could lead the UK and the EU into no-deal territory. But they are all deluded in their own way. In their refusal to compromise they risk jointly unleashing a dangerous crisis, whose endgame they can neither predict nor control. The motivations of the hardline Brexiters are, in some ways, easiest to understand. They believe that the proposal of Theresa May’s government would be the worst of all worlds: leaving Britain with the obligations of EU membership, without the supposed benefits of Brexit. But their argument that Britain should hold out for something better depends on dismissing all the warnings about no-deal as scare stories or “Project Fear”. So what are the hardliners really thinking? Perhaps they believe their own propaganda and simply do not accept or comprehend the legal and regulatory consequences that flow from no deal. Maybe their reverence for Britain’s “finest hour” in 1940 has created a certain nostalgia for rationing and the “blitz spirit”? But the Brexiters are surely mistaken if they believe that the chaos unleashed by crashing out of the EU would create national unity. It is more likely that Leavers and Remainers would round on each other with renewed fury, and that the political careers of many prominent Brexiters would come to an end. It is this last prospect that leads one school of Remainers quietly to embrace the idea of no deal. They argue that the only way of finally discrediting Brexit and politicians like Boris Johnson and Jacob Rees-Mogg is to let them have their way, and to force them to take responsibility for the results. But that argument is uncomfortably close to a Marxist embrace of the immiseration of the people as a necessary condition for political progress. It also rests on the questionable assumption that an economic and social crisis would strengthen the centre ground in politics. In the real world, it is more likely to empower the political extremes. There is also a milder version of the Remain case for no deal that, I admit, I have been attracted to. This rests on the hope that the May government is simply unable to negotiate a deal, or cannot get a hard-won agreement through the House of Commons. Under those circumstances, the Remainers hope that parliament would call a halt to proceedings and ask the EU for extra time to negotiate. The passage of time would make it possible to call a second referendum and Brexit might actually be stopped altogether. But, alluring as that option sounds to Remainers, it is actually a very hazardous long-odds bet. There is no guarantee that the EU would be willing or able to stop the Brexit clock. And there is no guarantee that a second referendum would be won. For Remainers, the more pragmatic, if depressing, option is to accept that Brexit will go ahead and to push the UK government to embrace the least-damaging version. After Brexit, economic and political logic is likely to lead Britain and the EU gradually to rebuild ties. The EU is evolving and Britain might eventually rejoin a second tier of the club focused mainly on trade and the single market. But where do the EU’s interests lie? While there might be a certain schadenfreude in Brussels at the sight of the British hoarding food and stuck in massive traffic jams, chaos in the UK is not ultimately in the interests of the rest of Europe. For while the hardest economic blows would fall on Britain, there would also be serious consequences inside the EU, particularly in economically vulnerable areas like northern France. A bitter rift between the EU and the UK would also be geopolitical madness at a time when Europe is under mounting pressure from Russia, China and the Trump administration in Washington. The EU cannot micromanage British politics from Brussels. Nonetheless, it is clear that if the EU side forcibly and explicitly rejects the May government’s proposal — essentially that the UK stay inside the internal market for goods, but not for services — it will make a no-deal Brexit much more likely. The European Commission has consistently argued that the “four freedoms” of the single market can never be divided, and that Britain must therefore choose something like the deals offered to Canada or Norway. But given the unique political, strategic and economic ties between the EU and the UK, it is not unreasonable to accept that the post-Brexit relationship should also have its own unique characteristics.All sides need to re-learn the art of compromise. And they do not have long to do it. CAMBRIDGE – The US stock market achieved its longest rise in its history on August 22, with the Standard and Poor’s 500 index up by 230% since 2009. Although this wasn’t the biggest increase in a bull market, it marked the longest period of increasing share prices. Several forces contributed to this impressive nine-year run. The primary driver has been the extremely low interest rates maintained by the Federal Reserve. 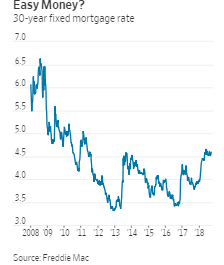 The Fed cut its short-term federal funds rate to near-zero in 2008 and did not begin to increase it above 1% until 2017. Even now, the federal funds rate is lower than the annual inflation rate. The Fed also promised to keep the short rate low for a long period of time, causing long-term rates to remain low as well. With interest rates so low for so long, investors seeking higher returns bought shares, driving up their prices. A rational model of share prices sets them equal to the present value of future profits. Low interest rates raised the present value of future profits, and the corporate tax reform enacted at the end of 2017, together with deregulation in several industries, has raised both current profits and expected future profits, contributing to the present value of future profits. But even with rising profits, low interest rates have caused share prices to increase faster than profits. As a result, the S&P price-earnings ratio is now more than 50% higher than its historic average. With real (inflation-adjusted) GDP rising at more than 3% this year, the strength of the US economy has induced foreign investors to shift their holdings to US equities. And in recent months, US households that had not owned stocks in the past, fearful of missing out on the bull market, have joined the equity bandwagon. But what of the future? Stock-market booms don’t die of old age; they are generally killed by higher interest rates. That often happens when the Fed raises the short-term interest rate to stop or reverse rising inflation. Although the Fed’s preferred rate of inflation – the price of consumer expenditures – has just reached its target of 2%, other measures of price growth are rising more rapidly. The overall Consumer Price Index (CPI) is now 2.9% higher than it was a year ago. Even “core” consumer inflation, which strips out more volatile food and energy prices, has increased by 2.4% over the past year. The Fed’s short-term interest rate is now just 1.75%, implying that the real rate is still negative. The Fed’s Open Market Committee has now projected that it will raise the federal funds rate to 2.4% by the end of 2018, to 3.1% by the end of 2019, and to 3.4% by the end of 2020. My judgment is that the greatest risk to the stock market is the future increase in long-term interest rates. The interest rate on ten-year Treasury bonds is now about 2.9%, implying a zero real rate when compared to the current level of the CPI. Historically, the real ten-year Treasury rate has been about 2%, implying that the ten-year rate might rise to 5%. Three factors will contribute to the rise in the long-term rate. The Fed’s projected increase in the federal funds rate will put upward pressure on the ten-year interest rate. With the unemployment rate at 3.9% and likely to decline further in the year ahead, the rate of inflation should continue to increase. And even if that does not cause the Fed to raise the federal funds rate at a faster pace, higher inflation by itself will cause investors to demand higher long-term rates to compensate for the loss of their funds’ real value. But the major cause of the rise in the ten-year rate is likely to be the massive fiscal deficit. The federal government is scheduled to borrow more than $1 trillion in 2019 and subsequent years. The Congressional Budget Office projects that the federal debt held by the public will grow from 78% of GDP now to nearly 100% over the next decade. Although foreigners now own about 50% of US government debt, recent reports indicate that foreign buyers are remaining on the sidelines and domestic investors are currently buying all of the new government debt. As the total amount of debt increases, investors will demand higher long-term interest rates to purchase it. The long-term interest rate will therefore be driven higher by rising short-term rates as the Fed normalizes monetary policy, higher inflation in response to tighter labor and product markets, and the explosion of the federal debt that needs to be absorbed by investors. The rise in long-term rates will reduce the present value of future corporate profits and provide investors with an alternative to equities. 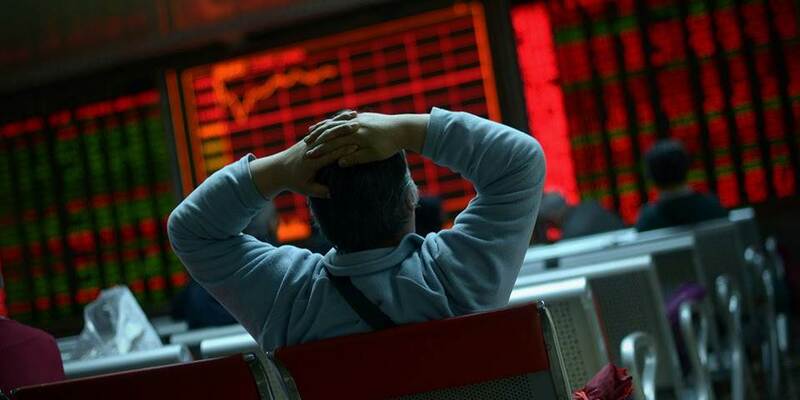 The result will be a decline in share prices. I don’t know when that will happen, but I am confident that it Will. On Wednesday, the Commerce Department reported that single-family housing starts increased by a modest 1.9% last month from July, leaving them below the levels they registered in the spring. Single-family permits, which measure how much construction is in the pipeline, fell to their lowest level in a year. Other housing measures, including existing and new home sales, have also been slowing in recent months. But if those things are headwinds for the housing market now, they could become even stiffer later. With the Federal Reserve on course to keep on raising rates through next year, long-term rates are on the rise again—the 10-year Treasury yield on Wednesday hit its highest level since May. A strong economy will likely keep driving unemployment lower, making the shortage of construction workers even more intense. For home buyers, the consequences of the tax-law changes may not have fully sunk in yet. Iran’s Kurds don’t usually make the headlines like Kurds in Turkey, Syria and Iraq do. Iraqi Kurds helped beat back the Islamic State and held a failed independence referendum last year. Syrian Kurds still control much of northern Syria and have become a point of serious contention between Turkey and the U.S., which supports them against the Assad regime. Turkey’s military invaded northern Syria to push Kurdish militant groups away from the Turkish border. Iranian Kurds have been quiet by comparison. To be sure, they’ve waged a low-level insurgency off and on with the Iranian regime for decades, but it’s held steady at a low simmer for some time. This summer, however, something seems to have changed. Who Are the Iranian Kurds? Some 8 million to 12 million Iranians identify as Kurdish (between 10 and 15 percent of the country’s population), which makes Kurds the second-largest minority group in Iran after Azeris. They are ethnically different from the majority Persians, and unlike the overwhelming share of the population, they’re Sunni. The Kurds in Iran, as in other countries, have been agitating – often violently – for greater self-determination or independence for decades. They achieved their goal once, briefly, with the establishment of the Republic of Mahabad in 1946, the only independent Kurdish state ever. Mahabad lasted almost 11 months before the Iranian army dismantled it and arrested and executed many of its leaders, members of what was at the time a fledgling group called the Democratic Party of Iranian Kurdistan, or PDKI. The PDKI survived and resumed the struggle in the 1960s, with a spike in violence after the 1979 Iranian Revolution, but by 1996, it was forced to declare a unilateral cease-fire because of a successful assassination campaign of its leadership by the regime. A new group, the Kurdistan Free Life Party, or PJAK, picked up the torch in 2004. Then, in April 2016, the PDKI recommenced its attacks. These are the largest and most significant of the Iranian Kurdish groups. Their relationships with other countries in the region are complicated. The PJAK is rumored to coordinate with the Kurdistan Workers’ Party, or PKK, a militant group in southeastern Turkey and northern Syria that the Turkish government considers a terrorist organization. Iran has charged Israel for years with supporting the PJAK. And during the Iran-Iraq War in the 1980s, Saddam Hussein’s regime initially supplied the PDKI with weapons and equipment to sow chaos within Iran. It’s little wonder, then, that Iran has banned Iranian Kurdish organizations from the country. They have instead set up shop in other places, predominantly the Kurdish autonomous region in northern Iraq. Last summer, well before he joined the Donald Trump administration as national security adviser, John Bolton wrote a brief at the behest of then-White House chief strategist Steve Bannon advising the administration on its Iran policy. In it, Bolton recommended “[announcing] U.S. support for Kurdish national aspirations, including Kurds in Iran, Iraq, and Syria” and “[providing] assistance to Balochis, Khuzestan Arabs, Kurds, and others.” Could the U.S. be following through on that advice? There were rumors during the presidency of George W. Bush that the U.S. was aiding the PJAK against Iran. Iranian media made similar claims about U.S. and Israeli supplies of weapons and funding to the PJAK during President Barack Obama’s tenure. 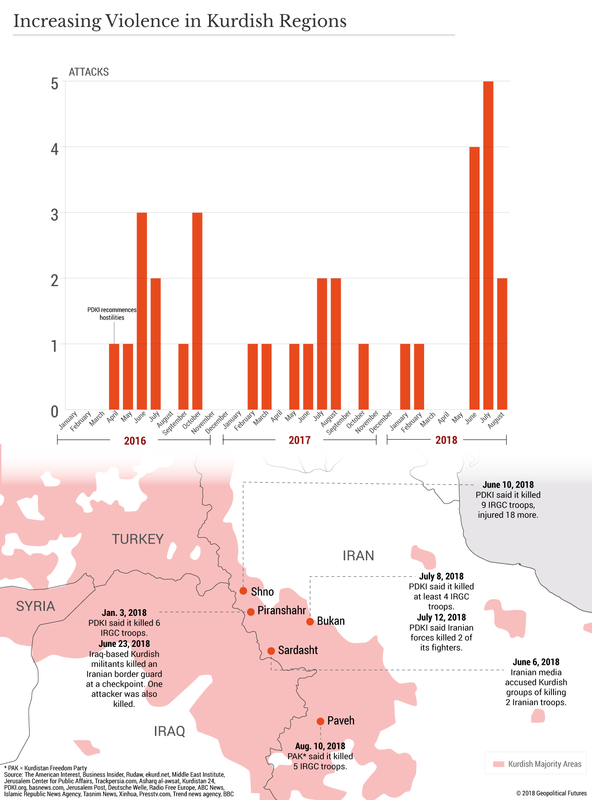 Given all the threats the Iranian regime is already facing, an uptick in violence by Iranian Kurdish militias would be more than simply a thorn in the regime’s side. The U.S. is already applying pressure to the Iranian economy; supporting the Kurdish insurgency would enable it to pressure its security establishment too. The United States’ goal is not necessarily regime change. Rather, the U.S. interest is in forcing Iran to abandon its efforts to build influence through proxies throughout the Middle East. A growing, coordinated insurgency – and indeed, the PDKI has reportedly been adding to its numbers of peshmerga fighters in Iran throughout the year – with U.S. support would tie up the regime’s domestic security forces, potentially forcing it to divert resources that for the past four years it has had deployed abroad. The logic checks out, but how does it look on the ground? In 2006, the U.S. State Department set up the Office of Iranian Affairs, whose goals include “to reach out to the Iranian people to support their desire for freedom and democracy.” In its 12 years, no head of the OIA had met with the leadership of the PDKI – the Iranian Kurds’ oldest and largest organization, remember – until this summer. PDKI Secretary-General Mustafa Hijri was in Washington in mid-June at the invitation of the Trump administration – a fact that is not on its own unusual. But then he met with Steve Fagin, then-director of the OIA. A few days after their meeting, Fagin was appointed consul general of the new, sprawling consulate that the U.S. is building in Irbil – the capital of Iraqi Kurdistan, where Iran’s Kurdish groups have a large presence. It isn’t a meaningless posting: When completed, that consulate will be the largest of its kind in the world (51 acres, with an anticipated construction cost of $600 million). Meanwhile, the U.S. is believed to be expanding its footprint at the Bashur Airfield, located in Harir in Irbil province, only about 40 miles (65 kilometers) from the Iranian border. This despite the fact that the U.S. is purportedly looking to draw down its military presence in Iraq. According to Kurdish media outlet Roj News, there was a protest July 20 in Harir after the U.S. banned travel into the mountains overlooking the airfield. The protesters said the local government was taking possession of fields they used for farming and grazing, forcing them to sell their livestock, and turning the land into a U.S. military camp. Some residents believe that the U.S. is planning to build a military barracks at the location in addition to the airfield. Regarding Hijri’s visit, an unnamed source from an American think tank who was familiar with the discussions told Al-Monitor news site that the U.S. wanted to know “if the Kurds are a united and a serious force.” (The PDKI, the source said, wanted to gauge Washington’s seriousness about “its aggressive stance on Iran.”) If it’s unity the U.S. is hoping for, it may be in luck. Days before Hijri’s trip, the PDKI reportedly met and discussed the establishment of some sort of inter-institutional entity that would enable different Iranian Kurdish organizations to more effectively coordinate their activities. Several groups already in 2017 formed a joint commission to better handle intelligence sharing, so this initiative would presumably go above and beyond what has already materialized. We would be remiss if we didn’t mention that a couple of weeks after Hijri’s trip, the PJAK also proposed greater cooperation and unity among Kurdish Iranian groups, including the establishment of a media agency to cover all Kurdish Iranian parties (each party currently has its own media organization), and was shot down by the PDKI and others. But based on its earlier actions, the PDKI clearly isn’t opposed to unification. More likely, it is opposed to unification on the PJAK’s terms. The groups have different visions for the insurgency. It won’t be easy to overcome these differences, but with Iran weak and the U.S. potentially spurring them on, their chances now are as good as ever. 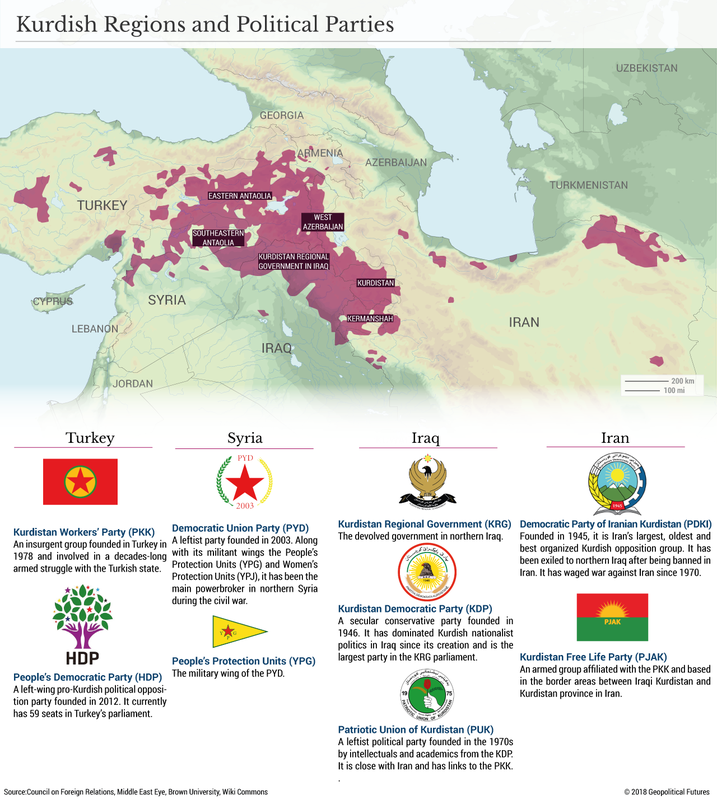 Syrian Kurds, Turkish Kurds and Iraqi Kurds have played prominent roles throughout the recent wars in the Middle East. Now, it appears that Iran’s Kurds, too, will come to command the attention of states that wish to tip the balance of power in the región. If you want to diversify your risks, invest with a bunch of different managers, right? Well, not always. When investment managers create diversity within their funds, chances are they will look similar to other managers also aiming for diversity. And that means they could all succumb to the same ills. This is a widespread issue, but it is highly relevant right now in risky credit markets. A simple illustration is index-tracking equity funds. There is almost zero benefit to investing in several managers that all track the S&P 500: You are just buying the same stocks via different channels. A more complex example is how banking developed over the years before the 2008 crisis. Banks grew large and they diversified across borders and business lines, which was partly to avoid their past mistakes of taking too much risk in one place, such as Texan real estate. But big global banks ended up with many of the same exposures, and so all hit the same problems at the same time. This diversification philosophy also drove securitization, the business of turning a big book of mortgages, for example, into a set of investible bonds. But you know the story: Each deal was diversified and risks were spread around, but too many mortgages were too similar and everybody lost. This idea is alive and well in today’s market for risky leveraged loans, where securitization creates so-called collateralized loan obligations, which buy 60% of loans. Despite the recent boom in the issuance of both loans and CLOs, markets remain concentrated. So CLO portfolios are often similar and the biggest loans are very commonly held, according to data from Fitch Ratings. In the U.S., debt from computer maker Dell International is owned by 86% of CLOs, for example. On average, U.S. CLO managers have roughly one-third of all borrowers in common, while in Europe about half of borrowers are common. Managers have different styles. In the U.S., for example, some like GoldenTree are credit pickers who take concentrated bets across their CLOs and own bigger chunks of far fewer loans. At the other end of the scale, MJX buys a little bit of many loans. On average, other managers have 28% of their borrowers in common with GoldenTree, but 79% with MJX, according to Fitch. 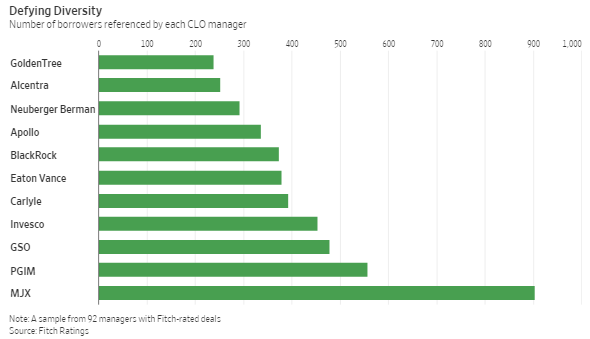 There is a simple lesson here for CLO investors: Never assume that investing with multiple managers diversifies your risk, as there is a fair chance you are buying many of the same underlying loans. But there is a potential pitfall here that everyone should note. Today’s loan market has a much greater concentration of deals with low ratings, single-B and below, which are more prone to downgrades and defaults. More low-quality loans everywhere likely means more widespread losses when a downturn comes—no matter what kind of diversification you think you have.